College students around the country are expressing mixed reactions in interviews and on social media to the not guilty verdict on Thursday in the stabbing death of a Bowie State University student a year ago. The verdict is a sigh of relief for friends of Alexis Simpson, who had been charged with first-degree murder after allegedly stabbing her roommate, Dominique Frazier, in her throat on Thursday, Sept. 15, 2011. Simpson was found not guilty on seven counts in Prince George’s County Circuit Court. “I am just glad that Alexis can finally put all of this behind her and move on,” she said. Simpson had been in jail from last September until April, when she was freed on a $250,000 bond and confined to her family’s home in District Heights, Md., without visitors as a condition of her release. She was one of three students who shared a four-bedroom suite with Frazier on the second floor of the apartment-style Christa McAuliffe Residential Community at Bowie State. According to District Court documents, witnesses told police that Frazier and Simpson had been arguing during the week before the incident. Frazier was in her bedroom and playing music in one of the suite’s two bathrooms as the students prepared to attend a comedy show as part of the homecoming activities that weekend. Simpson shut down the iPod and responded “no” when students asked her to turn the music back on, witnesses said. Frazier began arguing with Simpson in the hallway, and then they started fighting. One witness told police she was assaulted as she tried to break up the fight, but she was able to push Simpson into her bedroom and close the door. The witnesses said Simpson returned, swinging a knife. Frazier grabbed her throat, staggered into the hall and collapsed. Dora Kargbo, a senior biology major at Howard who is from Landover, Md., found Simpson’s self-defense claim credible, but doesn’t believe she should have been cleared of all charges. Simpson claimed she had been bullied and requested a room change. Founded in 1865, the university sits on 295 acres on the northern edge of Bowie, Md., a suburban community halfway between the state capital in Annapolis and the nation’s capital in Washington, D.C. Bowie State has fewer than 6,000 students, only a fourth of whom live on campus. Commuters and non-commuters alike consider it a safe haven. 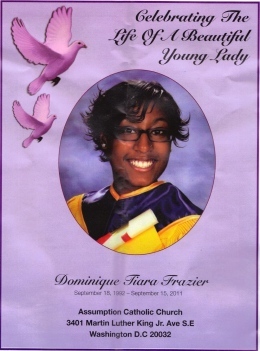 Obituary from Dominique Frazier's funeral. On the anniversary of Frazier’s death, which coincided with what would have been her 20th birthday earlier this fall, Bowie State held a memorial service, a candlelight vigil and other tributes. One of Frazier’s friends, Chidi Essinen, said she had her own style and was different than other young women on campus. “I never thought the last time she said goodbye would be the last time she said goodbye,” Essinen said after her death. Friends also set up Facebook pages for Frazier and Simpson. A Facebook page titled “Praying for Alexis Simpson” has been scattered with small mementos, words of inspiration and updates on the case throughout the past year. “A fair trial is all we wanted,” Ebony Watson wrote on the page. For those who don’t agree with the verdict, Courtney Evans said that she “understands their hurt,” but that Simpson was found innocent for a reason. Jaikenah Brown, a finance major at Spelman College in Atlanta, is concerned about the ripple effect of the jury’s decision. Nika Grant, a sophomore at Mount St. Mary’s University in Emmitsburg, Md., had similar sentiments. Taylor May, a biology major, at Tennessee State University, said that roommates need to be careful. Additional reporting by Charmaine Crutchfield, Malika Horton and Isaiah Maxwell for 101 Magazine and the Howard University News Service. Interactive timeline on random violence on U.S. campuses, below, by Mykalee McGowan. How do you feel about campus violence? Tell us in the comments section below. 15 College Tragedies on Dipity.